This doesn’t look like a good thing. It doesn’t feel anything like a blessing. What happened in my life is too hard and sad to ever have a good outcome. But what it feels like and looks like is not all that’s happening. God is orchestrating his will through the tough circumstances in my life. He is planning the best future for me and it’s obvious that this future looks nothing like I thought it would. When my son was killed, my plans and dreams blew apart and the only option I had was to hold on tight to my Rock. I trust that my Father God knows what he’s doing. Even though I don’t like it, I choose to trust. Joseph’s story in Genesis encourages me. He experienced many dark, confusing and cold places – and God was with him each time. When Joseph finally was put in charge of all Egypt, he began to store grain in preparation for the famine which God had revealed to him was coming. 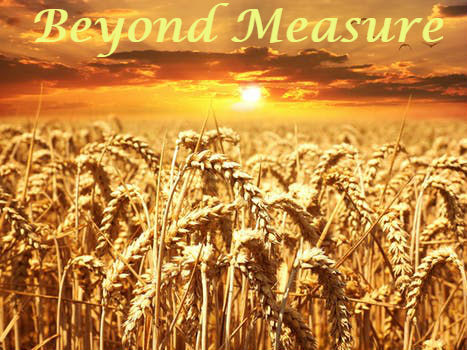 God blessed Joseph’s efforts to the point that he stopped keeping records of the amount of grain ‘because it was beyond measure’. As we read on in the story, we see that God’s plan to save Joseph’s family from starvation during the famine was also ‘beyond measure’. The plan started way back when Joseph was a teenager and only God could have put all of the puzzle pieces together in the way that he did. Only God could bring this much good out of the evil his brothers intended when they sold Joseph as a slave. I am a witness to the fact that God is still bringing good out of evil. I trust that, like Joseph, God is with me and I will be blessed ‘beyond measure’ as he completes his will in my life.